Niagara Falls Power | THERMO Spoken Here! A great volume of water flows down the Niagara River then passes over the spectacular Niagara Falls (partly in Canada and partly in the United States). About 15 million cubic feet of water per minute fall over the 167 foot escapement on its path to Lake Ontario. The location is ideal for construction of a massive hydroelectric power facility. The sketch shows geographic dimensions of the falls. 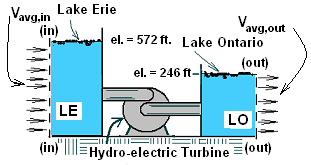 Suppose the flow "upstream" were dammed so the entire elevation change, surface of Lake Erie (El=572ft)to the surface of Lake Ontario (El=246ft) could be used for power with the falls flowing full at 15 million cubic feet per minute. Use data of the sketch. Calculate the maximum, ideal, power available from this physical reality. ♦ It is useful to sketch a system equavilent to the falls. We suppose an infinite reservoir upstream of the falls labeled: LE ~ Lake Erie. Downstream of the falls we place a second infinite reservoir labeled: LO ~ Lake Ontario. The system is define on its left and right boundaries by vertical cutting planes labeled, (in - in) and (out - out)" respectively. Water will flow into the system from Lake Erie, pass through piping to the hydro-electric turbines that will extract power then flow on to Lake Ontario. Observe the sketch. We will write the energy equation with some terms that don't apply struck out. • Our system was selected such that water entering from Lake Erie and leaving to Lake Ontario occurred in a steady manner. The lake water levels remain do not change. The properties of water are everywhere are constant in time. The entire falls does not move. Its center of mass has zero velocity. Consequently there is no extrinsic work rate. Also the volume of the system is constant During operation, the sum of heats is expected to equal zero. These are the reasons the above , struck-out terms are zero. • Our equation is written again below with the following reductions. Obviously the rate of mass flow of water that enters must equal the leaving rate. Also, since the entering and leaving planes are very large, the flow velocities across them are small and their kinetic energies are negligibly small. In preperation for our next steps, enthalpy is written as internal energy plus pressure times specific volume. • The dependence of internal energy is classically written as u = u(T,v). This notation informs us that internal energy changes with changes of temperature and or specific volume. We expect neither temperature no specific to change. Therefore we have uin = uout. To proceed in a thorough manner requires a discussion of energies of water crossing the "in" and "out" planes. It is shown in TORRICELLI'S THEOREM that the value of the sum, p/ρ + gz is the same at all elevations on the respective planes. The easiest elevation to evaluate the sum is at the water surfaces. Through Eqn-4 we worked on the "right," energy-exchange side of the energy equation leaving the "shaft work" where it lives to see if (as we expect) the sign on its numeric value will turn out (upon calculation) to be negative. The "minus" means energy leaves the open system with substance - water. The subscript "shaft" means the work left the water at the locatiopn of the power shaft.